Nutrition students complete field experience in various locations, including UMass, Western Massachusetts, hometowns, and abroad. Students can benefit in many ways from exposure to and experience in the field. These experiences can be on or off campus as one-time volunteer event or by participating in or organizing a program, through mentorship or shadowing a professional, via participation in a research project or through development or implementation of a community service or outreach project. Some of these can be used for credit and others are purely volunteer. We try to connect students with nutrition professionals looking for help but we encourage all of our students to investigate possible field experiences on their own. Looking for a Field Experience? Download our Field Experience Contact List for ideas. Students who want to work in the field or complete in-depth independent work in a particular area should contact a faculty member to see if there is any opportunity within the Department of Nutrition for research or other independent work. Sometimes a faculty member can help a student find work off-campus with a preceptor. The faculty sponsor will make sure that the student has established objectives for meaningful learning and criteria for success/evaluation as to what they will be accomplishing for the semester. Freshmen usually register for NUTRITN 196, Sophomores for NUTRITN 296, Juniors for NUTRITN 396 and Seniors for NUTRITN 496. Each credit is 40 hours of work, per semester, in the field or on a study - approximately 3 hours per week of work for the semester is 1 credit. The project could be research, nutrition education, or service. The faculty sponsor should meet with the student a few times over the semester to make sure they are progressing in their independent study. Faculty sponsors assign a grade; therefore it is important to make sure there are clear guidelines for the independent study and its assessment. If the student is working on a project with a faculty sponsor, they should be supervised on a weekly basis. 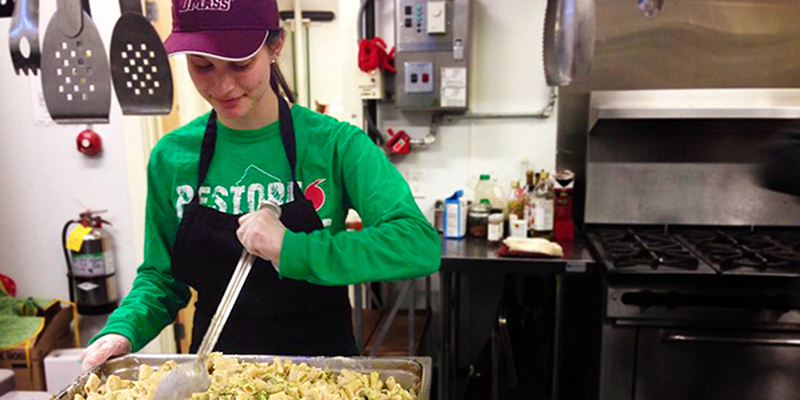 Civic Engagement and Service Learning (CESL) through UMass Amherst is a perfect opportunity for Nutrition students to further engage themselves in the community while gaining course credit and valuable experience. CESL offers a variety of programs that range from certificates to community engagement and leadership training. These programs can enhance students’ knowledge and skills in the areas of education, sustainability, health, technology, and leadership. Nutrition students can develop a stronger understanding of social justice issues and cultivate skills that can be used professionally. To learn more about CESL programs, check out the CESL website. *These two courses serve as a thesis/project seminar for students enrolled in Commonwealth Honors College. Students interested in this program need to apply, be accepted, and take all four courses. International study abroad or a domestic exchange is a great way for a Nutrition student to learn more about global nutrition, and have a terrific experience. But first things first – talk with your Nutrition advisor and figure out if Domestic Exchange or International Study Abroad is possible! Keep in mind that you may have to stay an extra semester or two at UMass Amherst, but completing a minor or secondary major in a foreign language is a great resume builder and also a great skill to have when it comes to working in nutrition and public health. Cooking Matters: Cooking classes and nutrition education for low-income families. Summer Food Service Project: This is a project funded by the USDA to bring school-aged children up to 18 years old fresh breakfast and lunches all summer long. Soup Kitchen: Sorted through produce and serve lunch. NuPlanIt: Independent Study with Cathy Wickham, Nutrition Ph.D. candidate. Conducted focus groups for a Boston-based nutrition counseling mobile app. FuelUp&Go! : Independent Study with Cathy Wickham, Nutrition Ph.D. candidate. Obesity prevention program in Springfield - nutrition education, physical activity, food tastings. Hospital Diet Tech: Reviewed diet orders, menus, and food/drug interactions with patients. Medlife: Provide medical care, education, and development to both local and international communities. The New England Health Center volunteer: elder-care facility; help improve existing patient care programs and engage patients in mental exercises.